[Sanskrit, “the lord who sees” or “the lord who hears the sounds of the world” or “the lord who is seen”] Known in China as the feminine being Kuan Yin or Kuan Shih Yin and in Japan as Kannon, Kwannon, or Kwanzeon. In Mahayana Buddhism, Avalokitesvara is the bodhisattva of infinite compassion and mercy; a bodhisattva is literally a “being of wisdom” who is destined to become a Buddha but has foregone the bliss of nirvana with a vow to save every being on earth. Avalokitesvara is a divine emanation of the Dhyani Buddha Amitabha, who embodies the quality of compassion in its highest sense. As one of the most popular and beloved Buddhist figures, Avalokitesvara’s attributes and miracles are recounted in many scriptures (sutras). His assistance is invoked often, especially for protection from natural disasters and calamities, to resolve personal and family problems, and to bestow children. 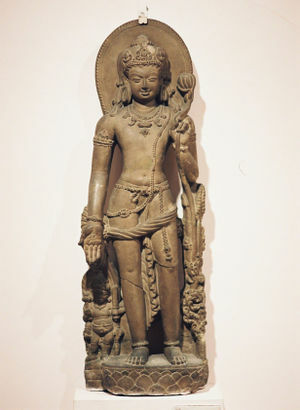 The Surangama Sutra records that Avalokitesvara has the power to appear in thirty-two different bodily forms, according to the different types of beings he is trying to save, and that he has the power to bestow fourteen kinds of fearlessness. Devotees invoke Avalokitesvara’s power and merciful intercession through the mantra OM MANI PADME HUM (“Hail to the jewel in the lotus!”). The worship of Avalokitesvara can be traced back to the second century in China and was well established in Tibet by the seventh century. Tibetan Buddhists believe that Avalokitesvara is incarnated in each Dalai Lama (the spiritual and temporal ruler of Tibet; the fourteenth Dalai Lama was forced to flee the country following the 1959 Tibetan uprising against the Chinese). Pearls of Wisdom, vol. 31, no. 4. This page was last modified on 7 February 2017, at 00:33.